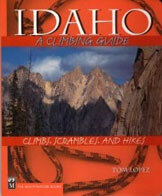 Climbing information for this peak and its sister peak, South Doublet, are found on page 322. 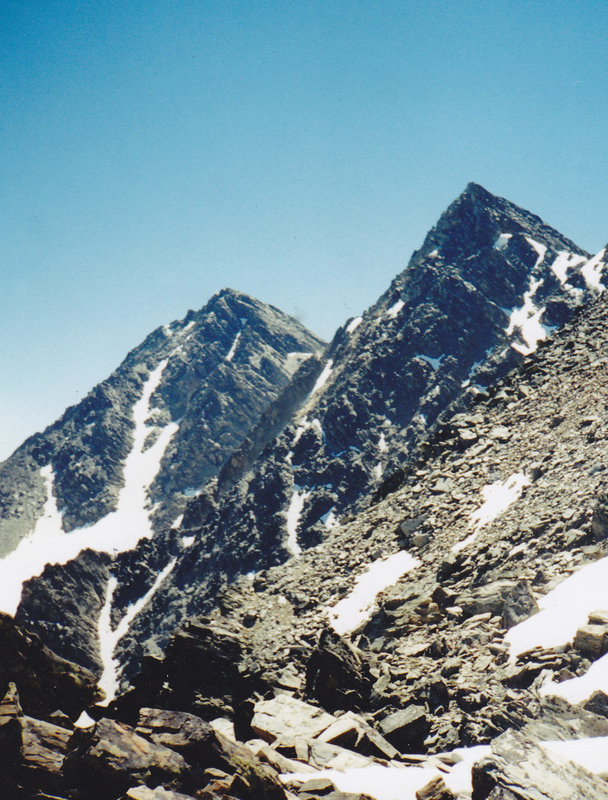 As of 2001,this peak is now officially named Sacajawea Peaks, West. Rick Baugher made the first ascent in 1998 and named it and it’s companion North and South Doublet. This is an impressive peak with difficult access. Use the link below to read a trip report from Kieran Balazs who climbed the peak from the Montana side of the border. Livingston Douglas climbed this impressive peak in 2017. He has provided us with a detailed route description for the northwest and east ridges as well as a clarification that “north ridge” is actually the northwest ridge. Read his invaluable updated route descriptions below. Via Mail Truck Road [(B)(2.1)] Please note that the book mistakenly calls the peak’s Northwest Ridge, the “North Ridge.” Thus, Rick Baugher’s first ascent was via the Northwest Ridge. Mail Truck Road ends at a small saddle that sits underneath, and just S of, Point 9341. The remnants of the mail truck are on the L/W side of the road here. Mysteriously, the road forks here. The L fork dies out pretty quickly and doesn’t even show up on the map. The R fork is an old mining road that does a descending traverse down the E side of Point 9341 and, after 1/4 mile or so, ends at an old mine. From here, you can see North Doublet/Sacagawea Peaks–West. This peak is quite intimidating and you might feel that there’s no way to climb this bad boy and keep the climb at a Class 3 difficulty level. But trust me, you will. Your next objective is to get into the basin that sits underneath the peak. Unfortunately, the terrain here is steeply angled and is an unpleasant combination of pine trees, boulders, and loose scree. This won’t be an easy bushwhack. But I have good news for you. You won’t need to bushwhack at all because some kind soul(s) built a climber’s trail that does a descending traverse from the end of the old mining road, passes a small saddle just NE of Point 9341, and angles its way NE into the gentle S end of the basin you wish to reach. You have to drop 250′ (in total) from Mail Truck Road to get into the basin, but this is a good alternative to climbing the steep, choppy spur ridge that leads up to Point 10,160+ and then traverse SE on the NW ridge of North Doublet on a very unwelcoming, choppy ridge crest (The North Doublet/North Ridge Route). From your safe perch in the lower part of the basin, you can see up-close-and-personal all of the ugliness of the North Ridge route. There is an easier alternative to the North Ridge Route that will get you up onto the NW ridge of North Doublet and will join the North Ridge route at a point where that route becomes an easy Class 3 scramble to the summit. Here’s how to do it. From the end of the climber’s trail (multiple cairns here) in the lower portion of the basin, scramble over or around some large boulders and terrain undulations to reach the basin’s tundra. From here, establish a line to climb the SW face of North Doublet. You want to reach the summit ridge just to the L/NW of the peak at a small saddle. Steep, Class 4/5 cliff bands will stop you from climbing directly up the W face of the peak. You must stay L/W of those [obvious] sections. Leave the gentle tundra of the basin and climb up the SW face on loose scree/gravel initially then on more stable talus/boulders higher up as well as some minor gullies with loose scree and gravel. Weave around as necessary to keep making upward progress, but keep a visual on where you want to reach the ridge. Too far L/W and you’ll end up in a choppy section of the ridge that you’ll have to subsequently scramble to approach the peak; too far R/E and you’ll be blocked by steep cliff bands and slab rock. Stay generally in the middle of the SW face. When you reach the NW Ridge, breathe a sign of relief. Your hard work is over. It’s now a straightforward Class 3 scramble up the ridge to the small summit of North Doublet. The view down the precipitous N face to Upper Miner Lakes is breathtaking. And, thankfully, if you also plan to climb South Doublet today, it’s tantalizingly close. 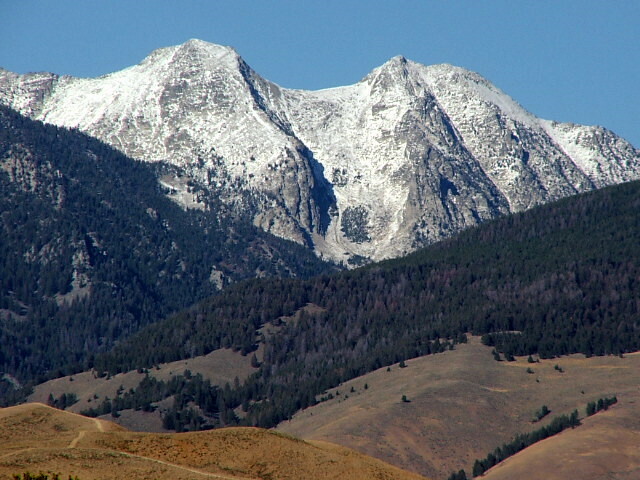 The Sacajawea Peaks clothed in the first snows of the season. Ridge traverse from North Doublet to South Doublet and back. multiple aretes and gullies on very unstable rock. Upon your return from the summit of South Doublet, either re-climb your descent route from North Doublet OR climb a narrow, but obvious, chute that lies just L/S of the ridge crest of the E ridge. The rock is reasonably stable in this chute. 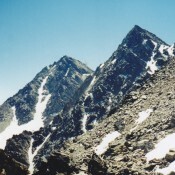 Near its top, the chute angles leftward to reach the S ridge of North Doublet. You’ll pop out on the S ridge less than 100′ from the summit. Scramble N up the S ridge to the summit of North Doublet. The steep chute is a Class 3+/4 option. I rather enjoyed it. It isn’t visible from the S ridge, so finding it when descending the E ridge of North Doublet would be difficult because there are multiple steep chutes here. The ridge traverse from North Doublet to South Doublet and back is far superior to an arduous, separate climb of South Doublet via the traverse from Mail Truck Road into the Geertson Creek drainage. That traverse looked pretty rough to me. The ridge traverse from North Doublet to South Doublet takes between 20 minutes (steep chute route) and 30 minutes (the gentler, S ridge diagonal traverse route) and, if done properly, has minimal exposure.